250 cranking amps help start stubborn 12V motors. 710 Peak amps. Battery Level LEDs indicate state of charge. 12Vdc power socket charges vehicle battery from inside vehicle. 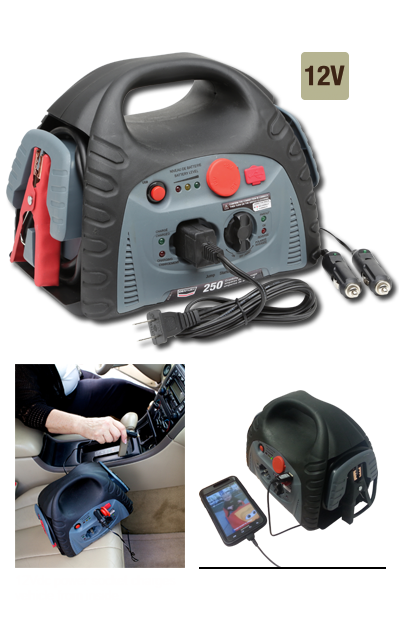 12Vdc power socket recharges Jumpstarter battery from inside vehicle. 12Vdc power socket for powering external 12Vdc devices. USB Port for charging 5Vdc personal electronic devices. Automatic Internal Charger charges internal battery. Red charging and green charged LEDs to monitor the charging process. On-Off switch with red (reverse) and green (correct) hook-up LEDs for safe hook-up to battery / chassis. Storage Holsters for neat clamp storage. years ago Century developed innovative technology allowing battery chargers to harness the transformer of a welder for its charging ability. Century was one of the first companies to pioneer a 110v battery charger. Shortly after we developed the "boost" feature that revolutionized the industry. The design was an instant success and provided the first real charging option.